The Shahdad Standard is currently the oldest known flag in the world. The squared bronze flag from Shahdad, Iran dates back to about 2400 BC. The Egyptian hieroglyph for "god" was a temple flag, so it seems flags were well-established around holy places probably by the dawn of the bronze age (~3000 BC). Earlier than that, I don't know. I have a different answer for this and just sharing what I know about this, it also does not mean the flag was invented in India, but in India more than 5000 years ago, flags were used. Perhaps it could be the first flag. In the epic Mahabharatha, for the Kurukshethra war between pandavas and kauravas, flags were used. 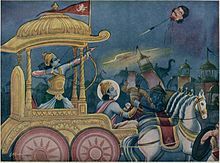 The Embelem on the flag of the arjuna chariot was Hanuman. The flag was called "Kapi Dhwaj". There is a specific description about this flag in Mahabharatha, since it has a certain importance. Also prior to Mahabharata, in the Great Epic Ramayana, there is a reference to a flag ('Dhwaj' in Sanskrit) for both Lord Rama's Ayodhya Kingdom and Ravana's Lanka Kingdom. If we come to Vedas, in the Atharva Veda it is mentioned that Indra had a Flag of his own called 'Indra Dhwaj'. There is no hard pictorial evidence for these references but the abundant use of the Sanskrit word 'Dhwaj' in almost all the scriptures is nothing but a flag which is attached to either the king's Chariot or at the entrance of his palace. So this answer tries to put some historical input from ancient India to this question. Many early civilizations used vexilloids for the purposes of flags. A vexilloid is a stick, staff, or pole with an emblem, usually a 3D or 2D solid object on top, and sometimes a row of solid objects up and down the staff. The standards of the Roman army are famous vexilloids. There are ancient Egyptian carvings and paintings of vexilloids thousands of years old. Many vexilloids had cloth attached, such as ribbons and streamers, windsocks (as in dragon flags), or rectangular cloths hung from horizontal crossbars (Roman vexilla or Nazi standards). A flag is a piece of cloth, sometimes with a single color but usually having geometric or pictorial designs and patterns in different colors, usually but not always rectangular. A rectangular flag is usually, but not always, longer in the fly (horizontal dimension) than in the hoist (vertical dimension). 1) Using clips to attach to lanyards (cords or ropes) to run them up and down flagpoles. 2) Permanent attachment to spears, poles, or staffs. This type of flag can be considered a category of vexilloid, I guess. According to Whitney Smith in Flags Through the Ages and Across the World (1975) cloth flags were invented in ancient Chine and gradually spread west through Eurasia and Africa, reaching Europe and the Mediterranean in the early middle ages. But the Shadad Standard from Iran 4,000 to 5,000 years ago is an enigma. Since it has no surviving cloth parts it is clearly a vexilloid. But the squarish bronze plate is clearly in the position that a cloth flag on a spear would have. So is the Shadad Standard a forerunner of flags, having a bronze plate where flags would have their cloth flags, or is it an imitation of cloth flags that already existed in Iran 4,000 to 5,000 years ago which have left no archaeological record? When was the first form of footwear invented? Are there examples of pre-industrial cruise ship?